Henry Crocker was born in Troy, New York in 1832. He moved to California in 1850 with his three brothers, Edwin, Clark and Charles, who became famous as one of the “Big 4” railroad barons. Charles Crocker is buried in one of the more spectacular family mausoleums on Millionaire’s Row in Mountain View Cemetery. Henry Crocker traveled to the mines, where he worked until 1856. He then moved to Sacramento where he opened a stationery store named Crocker & Edwards, which later became H.S. Crocker & Company. 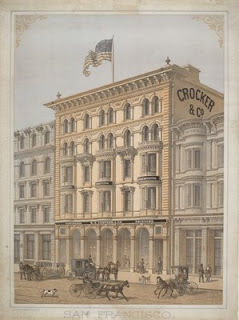 He opened a store with the same name in San Francisco in 1874 at 1st & Market Street[pictured above]. The company made stationary, maps and books. He married the former Clara Ellen Swinerton in 1864. 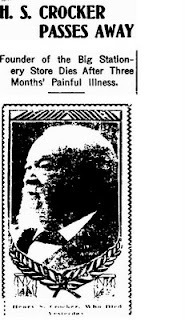 He died at his residence at the St. Francis Hotel after a three month illness. One of the floral tributes at his well-attended memorial service was a representation of a Benjamin Franklin Printing Press. The beautiful angel was designed by the San Francisco firm of Seregni & Bernieri. It is also the angel that graces the banner of this blog. Did the firm who designed the angel and tomb disclose that it's one of Giulio Monteverde's most famous statues? It's my favorite one in the whole cemetery and I did a lot of research to find the sculptor. There's another, unfortunately inferior, copy of it not far from Julia Morgan's grave and I've always wondered what the story was behind that version. Whoever did the one on the Crocker tomb got an almost exact replica of the original in Italy and I've always wondered if Monteverde's studio made it. I'd have to disagree with Patricia/Cait's comment that the Schmidt angel is somehow an "inferior" copy. That's an opinion I don't think many would share as I've posted the Schmidt angel on several Cemetery groups and gotten raves. I also prefer the Crocker version as it's softer but the Schmidt angel has a fierce look that has it's own quality. It would probably help a lot if the Schmidt angel had the same size platform to sit on...they skimpped on that it seems. I've also been to Rome and seen the original, and actually that one has an intensity that matches some aspect of the Schmidt angel. All of them are great sculptures. BTW these are based on a work of art called Melencolia I; a 1514 engraving by the German Renaissance master Albrecht Dürer.